Dogs and cats are prone to fleas and these are parasitic insects that tend to feed on the blood. Fleas not only cause severe itching in dogs and cats but also transmit flea tapeworms. They are primary cause of flea dermatitis in dogs that causes lesions as well as lead to severe hair loss especially around the tail and rump. Fleas cause a lot of discomfort in the form of severe itching and one of the best solutions to counter the flea problem in pets in using Capstar. Capstar is a flea medication for both cats and dogs that is being manufactured by Novartis International AG, one of the largest pharmaceutical companies in the world. Capstar is a well know Flea Treatment Tablet which is used to kill fleas on dogs and cats. It starts working within 30 minutes of tablet consumption. Capstar is very effective in killing fleas and it kills more than 90% of adult fleas within 4 hours on dogs. It also kills almost 90% fleas withing 6 hours on cats. During this period your dog or cat may scratch as a result of the fleas dying in side their fur. Capstar is being marketed under Novartis Animal Health Inc., which has been bought over by Eli Lilly ($LLY). What Capstar does for dogs and cats? Capstar is a non-prescription (OTC) flea medication for both cats and dogs. This medication is available in tablet form and is considered to be extremely fast acting. It is available in two types of packing, one for different sizes of dogs and another one for cats and another one for cats and dogs of different weight groups. The Novartis Capstar flea tablets for dogs and cats being reviewed here are meant for dogs and cats that weigh between 2 and 25lbs. Some dogs and cats may show minor side effects that include lethargy, decreased appetite, hyperactivity, diarrhoea, salivation, vocalization, difficulty breathing, hives, incoordination, and pupil dilation among others. Your pet might start scratching after feeding the capstar oral flea med as result of fleas dying. 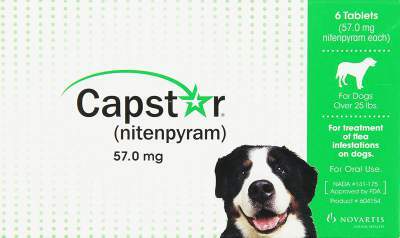 The active ingredient in Capstar is Nitenpyram. Is Nitenpyram effective in getting rid of cat and dog fleas? Yes! Nitenpyram is basically an insecticide that has long been used as a veterinary medicine as well as in agriculture to kill different types of external parasites including fleas in pets. In chemical terms, it is known as a neonicotinoid, which is a type of neurotoxin that ensures blocking of neural messages. It also binds tightly in the parasite or insect's central nervous system thus causing rapid death. 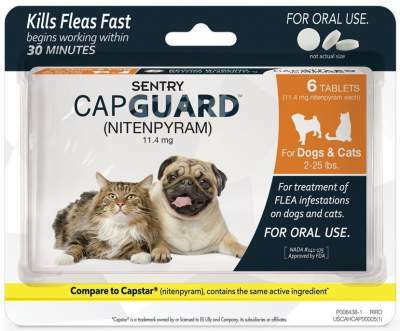 A controlled clinical study of Nitenpyram tablets was conducted by Food and Drug Administration (FDA) to study the effect of flea’s removal on cats and dogs. This was a double-blinded, multi-centered, placebo-controlled, clinical study on 157 cats naturally infested and weighing 2 lbs or more and of age 4 weeks or older. Nitenpyram/Capstar was administered orally to these cats once a day with minimum dose of 1.0 mg/kg and maximum of 16 daily dosage treatments. The clinical study revealed that Capstar was effective within 6 hours of initial administration and led to 98.4% dead fleas. Note: It is important to weigh your pet prior to starting Capstar administration as this will enable proper dosage. It is also advised not to administer the same to dogs or cats weighing under 2 pounds. Capstar has to be administered orally. You need to place the tablet directly in your dog or cat's mouth. Alternatively, you can also hide it in their food and ensure that they swallow the tablet with their food. Since, Capstar/Nitenpyram is an insecticide, it has its pros and cons as well. Let’s take a quick look at them. It is a safe tablet for consumption by pets and has rarely any side effects. It doesn’t affect humans administering the tablet. It is an OTC or over the counter product and hence, no prescription is required.It is safe for nursing or pregnant cats and dogs. 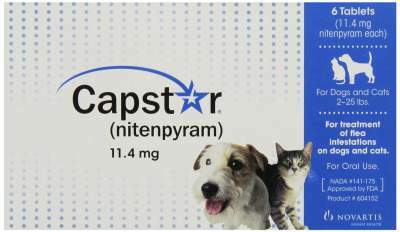 CAPSTAR tablets are indicated for fleas treatment on cats, kittens, dogs, and puppies, that are at least 4 weeks of age or older and have a minimum body weight of 2 pounds. Can be quite difficult to administer as cats and dogs might not be willing to swallow it. There are several different products available in the market that promises to be highly effective in killing fleas and help your pet to lead a “flea free” life. Capgaurd is another such product that is available out there. It is much cheaper medicine when compared to flea drops and other flea medicines for dogs. One of the things you wouldn’t want to be a witness to is your dog or cat spending their life scratching. Scratching is caused by fleas and they can be quite the irritant and can even lead to hair loss. What you need is a medication for your pet that will be highly effective. This is where Capstar can provide the best solution as it works fast and can provide long-term flea protection.